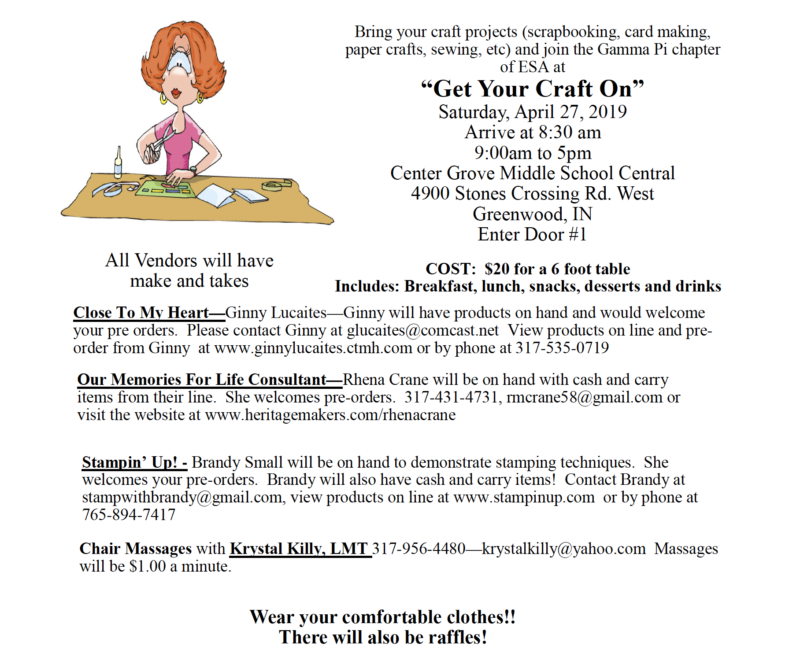 Join Gamma Pi, Indianapolis for a Craft Day on April 27 at Center Grove Middle School Central from 8:30 am to 5:00 pm! $20 will get a 6 foot table and breakfast, lunch, snacks, desserts, and drinks will be provided. Vendors will also be present and all will have make-and-take crafts! Vendors include Ginny Lucaites from Close to My Heart (www.ginnylucaites.ctmh.com, glucaites@comcast.net), Rhena Crane from Our Memories for Life Consultant (www.heritagemakers.com/rhenacrane, rmcrane58@gmail.com), Brandy Small from Stampin’ Up! (www.stampinup.com, stampwithbrandy@gmail.com), and chair massages for $1 per minute with Krystal Kelly, LMT! There will also be raffles throughout the day! Download the registration form here: Gamma Pi Craft Day Registration Form and contact Lynn Howley with any questions at 317-840-0996 or lehowley@gmail.com.